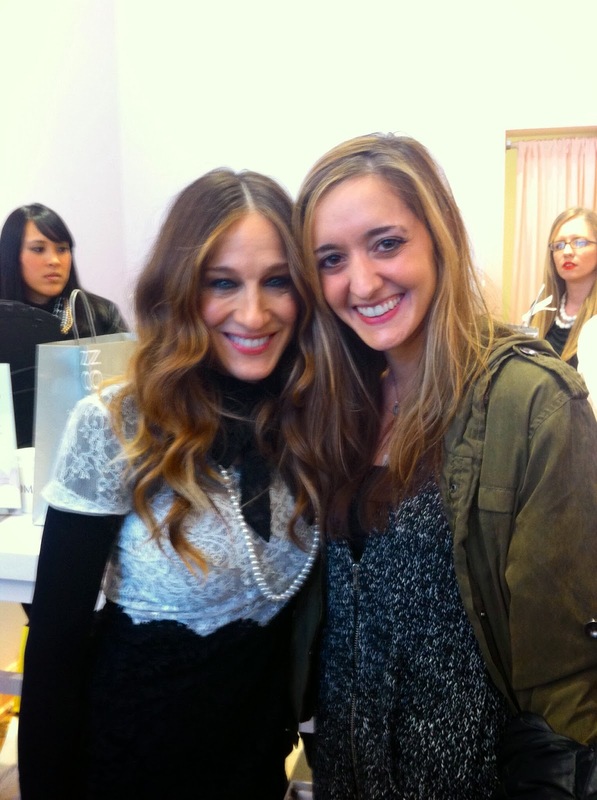 My adventure last week included meeting one of every girl's fashion idols, Carrie Bradshaw, I mean, Sarah Jessica Parker! In case you haven't heard, SJP recently launched her first shoe line with Nordstrom (shop the collection here). In addition to being able to buy the shoes online & in Nordstrom stores, SJP & Nordstrom opened a pop up shop in SoHo, which ends today(!) so if you have a chance, take a long lunch & 'pop' in (additional US appearances here). My coworkers & I decided to do just that last Friday! Walking into the store, we were surrounded by colorful shoes, feminine details & SJP, herself! After laying eyes on these red geranium heels, I was hooked & knew I wouldn't be leaving the store without them. Sarah Jessica was kind enough to take photos & sign the shoes for each customer. As I got up to the register, she gave me a funny look & said "you look really familiar..." Stunned, I replied, "we met years ago on Amagansett beach!" Her eyes & mine lit up as I retold the story of her son plopping down on one of our beach chairs & her family later stopping by my family's bonfire. "Come say 'hello' next time you're out there!" I was pleasantly surprised by how sweet, humble & easy to chat with she was, thus making me an even bigger SJP fan! During our time in the store, I noticed her flitting around from customer to customer assisting with sizing & thanking each one for being apart of her brand's launch. Anyone could tell how enthusiastic she is about the collection as well as how much time & effort she has put into the design & craftsmanship of each pair. So seriously, if you're in the market for a great new shoe, SJPxNordstrom is the way to go! Wow love the skies especially the colors can't wait to get home tonight and buy some sandals!